When I was growing up, I don't remember eating much yogurt until high school. Even then, I think I probably started to eat it because the 'cool kids' were all packing a lemon yogurt wrapped in foil for lunch everyday. At the time, it was a taste that took me a while to acquire. Now, well, I rather enjoy yogurt and typically take one for lunch everyday. As seems to be the case with most anything that I am eating, my kids want it to (now if that isn't incentive to eat right, I don't know what is!). In order to encourage them to eat yogurt, and make sure it is the right size for them, I typically try to stick with the multipacks of 'regular' yogurt or pick up a kids' yogurt pack. The kid's yogurts seem to come in some seriously fun flavors - perhaps if when I was growing up Cotton Candy was an option for a yogurt flavor, maybe I would have eaten it more often. "Everyone knows that “Trix are for kids,” and now Yoplait Trix yogurt is giving moms even more reasons to love it! 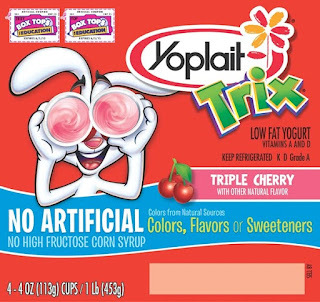 Yoplait Trix yogurt has been reformulated to remove artificial colors, flavors, sweeteners, and high fructose corn syrup, but only you will know the difference! Whether it’s for an afterschool snack or the highlight of your kid’s lunch box, now you can feel even better about giving your kids the snack that has the same great taste with two bright natural colors in every cup that they can enjoy every day. Throughout the month of January, look for Bonus Box Tops for Education on each package of Yoplait Trix yogurt to help earn cash for your child’s school!" You can learn more and connect with Trix Yoplait Yogurt, by checking out their Products Website, Like them on Facebook, and/or follow them on Twitter. 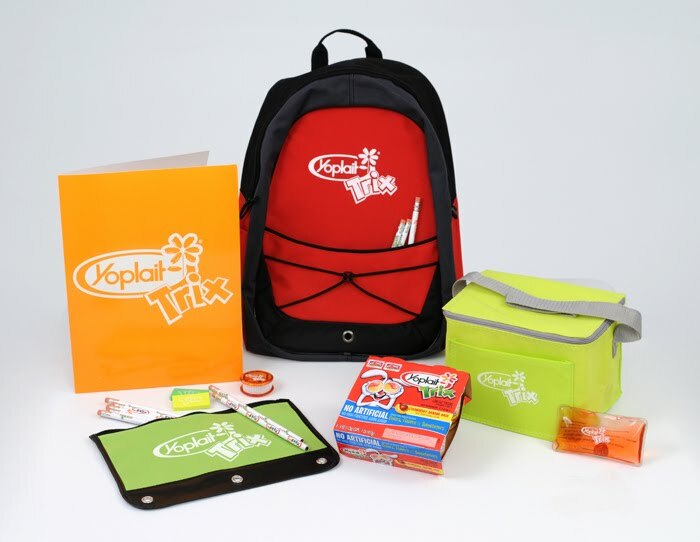 Yoplait branded items including an insulated lunch tote, ice pack, backpack, folder, zippered pencil pouch, pencils, erasers, and pencil sharpener. Giveaway will remain open through March 15th. Giveaway is open to residents of the US only. One winner will be selected through Rafflecopter. The winner will have 48 hours to respond or a new winner will be selected. No compensation was received for this post. All opinions expressed are my own or that of my family. The Yoplait Trix Yogurt prize pack, information and coupon have been provided by Yoplait through MyBlogSpark. we usually have yogurt as a sweet snack. The girls love yogurt anytime. My kids like as an after school snack. As a after school snack. My five kids love this for breakfast, and honestly I do too, no messy cleanup and cook up! My kids love Trix yogurt with lunch! My kids eat for a nighttime snack. He loves it for breakfast or a snack! usually with lunch or an after school snack. My kids like to take it in their school lunch! Clearly Fresh Bags - discount code!